It is quite well known that the highly renowned Carl Jung had a powerful premonition of the First World War about a year or so before it began. What is unfortunately not so well known is that H.P. Blavatsky had what “The New Yorker” magazine of May 1964 called a “much earlier and even more realistic vision” of things to come. HPB clearly foresaw – and described in soberingly accurate detail – not only the First World War but also the Second World War. She did so in 1888, 26 years before the first conflict and 51 years prior to the outbreak of the second. 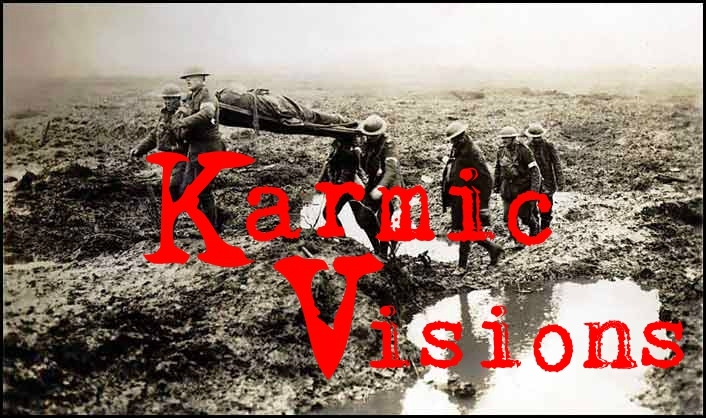 She describes past, present, and future events in compelling story form in her article titled “Karmic Visions” which was published in the British Theosophical magazine “Lucifer” in June 1888. It is not actually known for definite how she came to be in possession of such profoundly prophetic insight into the coming Wars. She may indeed have literally had a vision but may also have simply been able to access the information as easily as you or I can access information on the internet, by means of her undeniably highly developed spiritual powers. Alternatively, it may be that her Indian Masters – the Mahatmas of the Trans-Himalayan Brotherhood – worked together with her on the article. Whatever the case may be, the “Visions” referred to in the article’s title are not her own but are those attributed to the protagonist of the story. So, unlike with Jung’s prophetic insight, war was most definitely not “in the air” at the time that HPB penned the article. Yet it would seem, from its nature and contents, that both World Wars were already unavoidable and that it was now too late in the day to put a stop to them or prevent them from happening. And why was this? Because of KARMA. The causes had already been set in motion, even as far back as the 5th century AD, and now those causes and a conglomeration of other related causes were on the verge of resulting in a massive and deadly Karmic effect. What we sow, we must eventually reap. What we reap, we must have previously sown. This is the Law of Karma. It is nothing to do with fatalism or with the judgment or anger of any type of God. The Law of Karma is the law of self-created destiny. In the past we created our present and in the present we are creating our future. Each one of us possesses tremendous and almost unthinkable responsibility but very few actually realise this to be the case. Our actions now, even some of those which may seem inconsequential, will have great bearing and effect not only on ourselves but also on others in both this and future lifetimes. The protagonist of “Karmic Visions” is Frederick III of Germany. Although unnamed in the article, the details and descriptions all serve to make it plainly apparent that it was him. Frederick III died of throat cancer at the age of 56 just as the article was going to press. The article concludes with the individual, obviously Frederick, terribly weak and on the verge of death from throat cancer, a malady which, it is implied, was part of his Karma for having callously driven his spear straight through the throat and neck of an aged seeress or prophetess during his incarnation as Clovis, the 5th century ruler and founder of the Frankish kingdom. The Franks were a confederation of Germanic tribes and Clovis was, in HPB’s words, a “heartless despot,” a vicious, evil, and bloodthirsty warrior, his famed conversion to Christianity (at the instigation of his wife Clotilde, the Burgundian princess) notwithstanding. Then we see the soul that had incarnated as Clovis eventually reborn, in the same part of the world, as Frederick, son of Kaiser Wilhelm I. A brief yet informative overview of his life can be read in the Wikipedia article about him at http://en.wikipedia.org/wiki/Frederick_III,_German_Emperor. But it would not be too long before Frederick was to develop the debilitating cancer of the larynx which caused him such awful, prolonged, and debilitating suffering throughout the remainder of his life. After a reign of just 99 days, Frederick III, Emperor of Germany and King of Prussia, passed away amidst great physical and mental suffering. Heir to the throne was his eldest son, Kaiser Wilhelm II, who went on to become one of the prime movers of the First World War. One month after Frederick’s death and the publication of “Karmic Visions,” Adolf Hitler was conceived. He was born in April 1889. The rest, as they say, is quite literally history. The “Karmic Visions” article probably meant little to those who read it at the time, other than the obvious identity of the protagonist. But who can read it today, after the occurrence of the events it describes, and not feel profoundly sobered or even shocked and deeply moved? Please visit the Articles page to see the complete list of over 200 articles relating to Theosophy, Madame Blavatsky, and the Theosophical Movement.